When Congress created the NRC in 1974, it established three specific offices within the agency. One of them was the Office of Nuclear Material Safety and Safeguards, or “NMSS” in NRC shorthand. This office was charged with regulating nuclear materials and the facilities associated with processing, transporting and handling them. This charge was, and is, broad. The NRC’s materials and waste management programs cover facilities that use radioisotopes to diagnose and treat illnesses; devices such as radiography cameras and nuclear gauges; and decommissioning and environmental remediation. It also includes nuclear waste disposal and all phases of the nuclear fuel cycle, from uranium recovery to enrichment to fuel manufacture to spent fuel storage and transportation. And there’s more. The program also does environmental reviews and oversees 37 Agreement States, which have assumed regulatory authority over nuclear materials, and maintains relationships with states, local governments, federal agencies and Native American Tribal organizations. As with all organizations, the NRC’s workload has ebbed and flowed in response to a multitude of factors. Over the years, NMSS went through several structural changes to address its workload changes. In 2006, NMSS was gearing up for an increase in licensing activity related to the processing, storage and disposal of spent nuclear fuel. At the same time, the Agreement State program was growing, requiring additional coordination with the states—a function then housed in a separate Office of State and Tribal Programs. To meet these changes and ensure effectiveness, the NRC restructured NMSS. Some of its programs were moved, including the state and tribal programs, into the new Office of Federal and State Materials and Environmental Management Programs (FSME). NMSS retained fuel cycle facilities, high-level waste disposal, spent fuel storage, and radioactive material transportation. FSME was responsible for regulating industrial, commercial, and medical uses of radioactive materials and uranium recovery activities. It also handled the decommissioning of previously operating nuclear facilities and power plants. The NRC’s materials and waste management workload has now shifted again. At the same time, the agency is exploring ways to reduce overhead costs and improve the ratio of staff to management. So, NRC staff launched a working group last fall to review the organizational structure of the NRC’s materials and waste management programs. With the focus shifting to long-term waste storage and disposal strategies, and an increasing number of nuclear plants moving to decommissioning, the group recommended merging FSME’s programs back into NMSS. NRC’s Commissioners approved that proposal last week, and the merger of the two offices will be effective October 5. We think this new structure will better enable us to meet future challenges. It will improve internal coordination, balance our workload and provide greater flexibility to respond to a dynamic environment. Current work, functions and responsibilities at the staff level will be largely unchanged. The management structure will realign into fewer divisions, with fewer managers. In their direction to the staff, the Commissioners asked for careful monitoring of the changes and a full review after one year. We fully expect these changes to improve our communications both inside and outside of the agency, and provide for greater efficiency and flexibility going forward. My biggest concern still is that no proven “million-year” safe final storage seems to have come forward worldwide. Yet decommissioning of plants, aging “reprocessing” plants, the final burial of the idea of “closing” the fuel cycle via the above-mentioned and -critisised fuel reprocessing (or transmutation, another science fiction story) call every more urgently for a final burial sites or sites for all high and medium active radioactive wastes that allow for several hundred thousand years of burial. Apart from the pyramids no such structures seem to have survived even fractions of that time horizon yet no one really wants to own up to this being no closed loop but a “bottomless pit”. If the NRC can’t make an international case for reuse of “reprocessed uranium” as a by-product of reprocessing, I don’t think that reprocessing boosters pushing for the totally unneeded finalization of by the NRC of rules concerning reprocessing plants will be too happy. Mentioning that reprocessing of MOX, which is not even used in the US, does not occur in the US, leaves out the most important part of that story – that spent MOX in France is not reprocessed and is simply stored. That might be called a once-through MOX cycle. 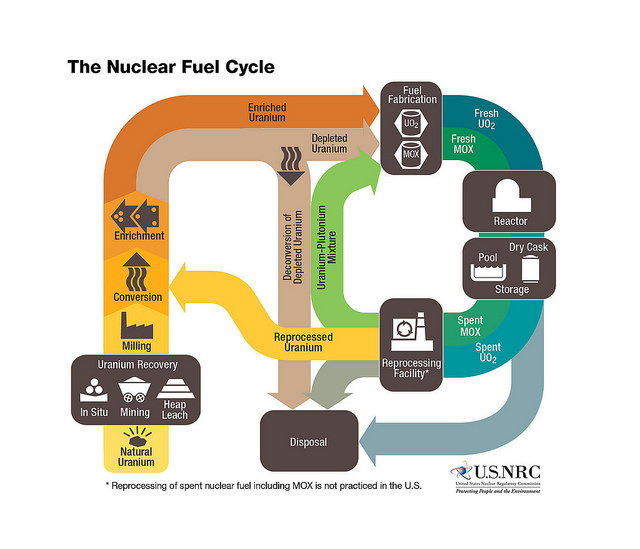 As the note at the bottom of the graphic says: Reprocessing of spent nuclear fuel, including MOX, is not practiced in the U.S.
Is that diagram of the fuel cycle theory or fact? I see your diagram has a path whereby “reprocessed uranium” goes back to be used as fuel. Based on the experience of the countries that have or currently engage in reprocessing – the numbers continue to dwindle with withdrawal of all continental European countries except France and the end soon of reprocessing in the UK – is that really true (beyond small amounts in France)? It has never been true in the US, with “reprocessed uranium” from the failed reprocessing experiment at West Valley (1966-72) or from the DOE weapons facilities where reprocessing occurred (Hanford and Savannah River Site). With this reorganization will the public actually see results?! The NRC has fumbled the ball repeatedly on a permanent storage facility for spent nuclear fuel. This has been going on for decades! In the meantime this highly radioactive fuel has been piling up at a hundred places all over the US. This makes every one of these sites an even more tempting terrorist target. This is just plain shameful and dangerous! This reorganization is bound to make things better, they cannot be any worse! Long Term Fuel Storage will be a key issue “forever” since most ☢ waste has very long half lives and therefore will need to be monitored “forever”, so we might as well figure out not only how to do it safely but as cost efficiently as possible! Previous Previous post: Come visit us on Facebook!